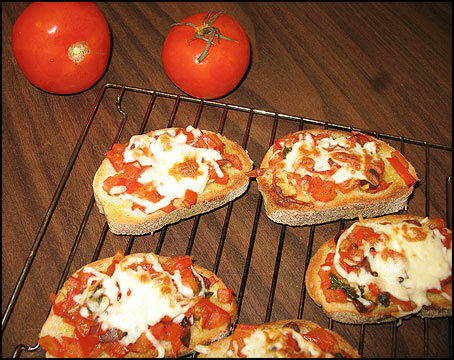 Bruschetta is a very simple dish to make. It just starts with slices of baguette as a base and any toppings you wish. Normally tomatoes are parboiled and peeled before making this dish. But when boiled and peeled, tomatoes have a tendency to become mushy and soggy. So I thought of using fresh tomatoes with some sundried tomatoes which gives a very strong flavor. But the options are endless. You can use any topping as you wish. See variations below. Variations: Try using different herbs such as parsley. Instead of just tomatoes try mixing white/navy beans with tomatoes as a topping or another variation can be using portabella mushrooms. When using portabella mushroom, try sautéing with different spices such as ground coriander, cumin and paprika.